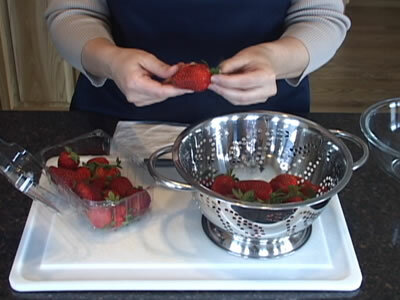 Check out this handy RecipeTips.com video demonstration for cleaning and preparing strawberries for use in strawberry pie, strawberry cake, chocolate covered strawberries, and all of your other favorite strawberry recipes. Today I am going to show you how to clean strawberries. For more information on strawberry preparation and recipes, visit RecipeTips.com. The first step to cleaning strawberries is to go through the carton that you purchased from the store. Go through and check each strawberry to make sure there is no bruising or spoiling. If there is a significant amount, go a head and through that strawberry away. If the is just a little bit, it can be cut out later. Strawberries are most flavorful at room temperature so remember to remove your strawberries from the refrigerator about an hour before you are ready to prepare them. The next step is to wash the strawberries. The best way to do this is with a damp paper towel and just wipe them off. If there is a lot sand or dirt on the strawberry, you can go a head and rinse it under cool water but in that case it is best to leave the stem on because strawberries are very porous and they will absorb some of the water. One your strawberries have been cleaned, you want to go through and remove any small blemishes that may be on the strawberries. This can easily be done with a paring knife, just remove that section. The next thing we are going to do is to remove the stems of the strawberries, so that can be done a couple of different ways. The easiest way is to use a paring knife. You just take the knife and angle it down into the strawberry and just gently go around the stem and remove it that way. There are two other ways of doing it and two other tools you can use. One is a corer and to demonstrate that you just insert the corer right around the stem to make a circular pattern around it and remove it that way. The third is a strawberry huller. It is done the same way as the corer. You just stick the huller into the strawberry and pinch and pull.